While there has been a significant amount of armed group activity in Libya this week, there have been no notable incidences connected to Jihadi actors outside of ISIS. For ISIS activity, see the ISIS in Action section. 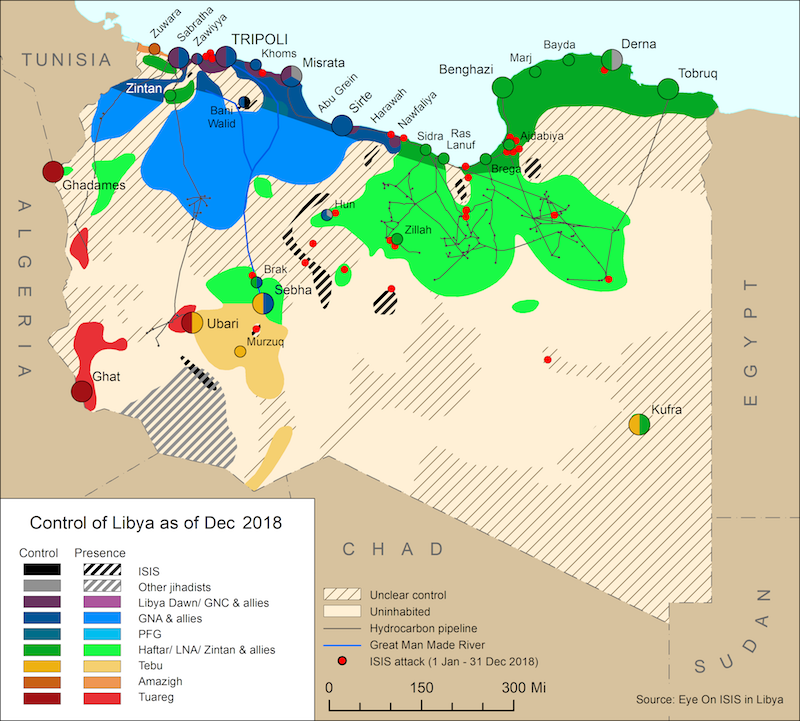 On 28 December, the Libyan National Army announced the full purge of jihadist forces from Benghazi – six months after the LNA initially declared the city liberated. The following day, Derna reportedly received some of the fleeing BRSC-linked fighters. On 27 November, the LNA conducted an airstrike on DMSC targets in al-Dahra al-Hamar area, south of Derna. On 23 November, a mutiny inside a Misratan prison among Islamist hardliners led to four prisoners fleeing, with two later killed in a faceoff with prison guards. On 18 November, the LNA conducted two airstrikes against DMSC targets in al-Dahra al-Hamar area, south of Derna. On 16 November, the Egyptian Ministry of Interior said that the perpetrators of an attack against Egyptian police forces in the Wahat area in Egypt on 20 October ,were trained in Derna. On 14 November, the Misrata local attorney released a number of high profile fighters with suspected links to extremist groups, on the grounds of illegal arrest procedures. On 9 November, the LNA claimed complete control of Sidi Khribesh district of Benghazi. The LNA reportedly defeated the remnants of the jihadist coalition hiding there. On 7 November, the death of BRSC member Mohammed Bakr al-Yedri, known as ‘al-Nahla’ led to protests in Misrata. On 5 November, the GNA- appointed Deputy Minister for Interior in Benghazi, Faraj Gaem, survived an IED assassination attempt on his motorcade and intense clashes broke out in Benghazi between the LNA and ‘remnants’ of the BRSC. In Tripoli, Rada raided a comic con event and Igtet called for the JCP to disband. On 20 October, two young DMSC fighters, Salem Abdul Wahhab al-Gerbadi and Abdullah Idris al-Gabaili, were killed in clashes between the LNA and the DMSC in the Dahr al-Hamar area south of Derna. On 23 October, Rada Special Deterrent Force arrested two senior members of the DMSC, Khalid al-Hassadi and Adel al-Karghal, at a hotel in downtown Tripoli. 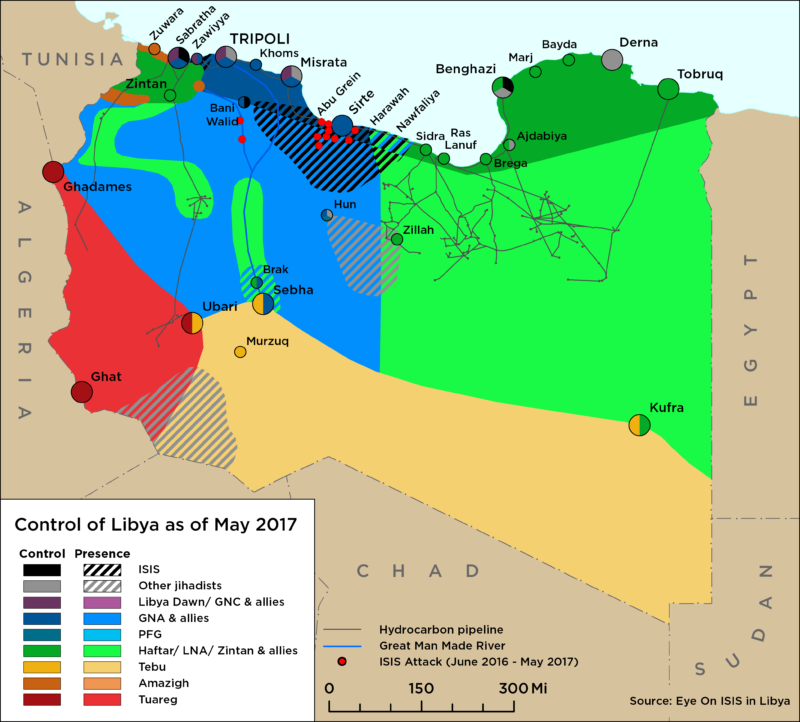 In the wake of the ISIS attack in Mirata earlier this month, on 11 October, clashes broke out between hard-line fighters affiliated with Islamist factions and Misratan security forces, during a security operation in al-Sakt area south of Misrata city. Thirteen people were arrested, including two senior leaders of the BDD. In Washington D.C., Ahmed Abu Khattala is currently on trial for his alleged involvement in the September 2012 attack on the US Special Mission in Benghazi that killed 4 Americans. The Supreme Committee for Issuing Fatwas (Al-Lajna al-‘Ulya li-l-Ifta’), which is based in the eastern city Al-Bayda and is associated with Khalifa Haftar, has called for Jihad in Sabratha against “Kharijites,” a term used by Dignity Operation members to label their opponents. The announcement follows the Committee’s controversial Fatwa denouncing Ibadis earlier this summer. Following this announcement the eastern government, headed by Abdullah Al-Thanni, ordered mosques in the region to perform Qunut prayers to ask God to defeat the “Kharijites” in Sabratha. On 28 September, the Attorney General’s Office said that the storming of the US Special Mission in Benghazi on 11 September 2012 was carried out by Ansar al-Sharia, under direct orders from AQ leader Ayman al-Zawahiri. On 2 October, the trial of Ahmed Abu Khatallah, who is accused of orchestrating the Benghazi attack, began in the US.